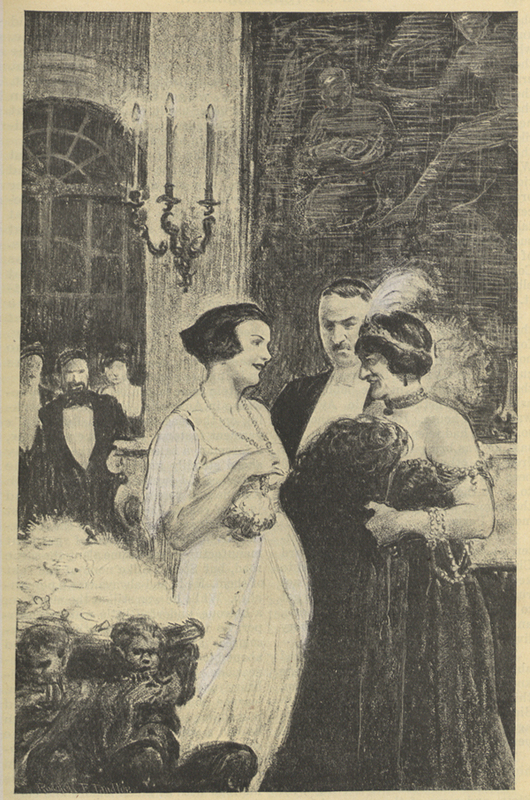 Source File: cat.ss055.xml From The Century Illustrated Monthly Magazine, 98 (August 1919): 433-445. CONNIE AYRSHIRE had a cold, a persistent inflammation of the vocal cords that defied the throat specialist. Week after week her name was posted at the opera, and week after week it was canceled, and the name of one of her rivals was substituted. For nearly two months she had been deprived of everything she liked, even of the people she liked, and had been shut up until she had come to hate the glass windows between her and the world and the wintry stretch of the park they looked out upon. She was losing a great deal of money and, what was worse, she was losing life; days of which she wanted to make the utmost were slipping by, and nights which were to have crowned the days, nights of incalculable possibilities, were being stolen from her by women for whom she had no great affection. At first she had been courageous, but the strain of prolonged uncertainty was telling on her, and her nervous condition did not improve her larynx. Every morning Miles Creedon looked down her throat, only to put her off with evasions, to pronounce improvement that apparently never got her anywhere, to say that to-morrow he might be able to promise something definite. Her illness, of course, gave rise to rumors—rumors that she had lost her voice, that at some time last summer she must have lost her discretion. Connie herself was frightened by the way in which this cold hung on. She had had many sharp illnesses in her life, but always before this she had rallied quickly. Was she beginning to lose her resiliency? Was she, by any cursed chance, facing a bleak time when she would have to cherish herself? She protested, as she wandered about her sunny, many-windowed rooms on the tenth floor, that if she was going to have to live frugally, she would n't live at all. She would n't live on any terms but the very generous ones she had always known. She was n't going to hoard her vitality. It must be there when she wanted it, be ready for any strain she chose to put upon it, let her play fast and loose with it; and then, if necessary, she would be ill for a while and pay the piper. But be systematically prudent and parsimonious she would not. When she attempted to deliver all this to Doctor Creedon, he merely put his finger on her lips and said they would discuss these things when she could talk without injuring her throat. He allowed her to see no one except the director of the opera, who did not shine in conversation and was not apt to set Connie going. The director was a glum fellow, indeed, but during this calamitous time View Image of Page 434 he had tried to be soothing, and he agreed with Creedon that she must not risk a premature appearance. 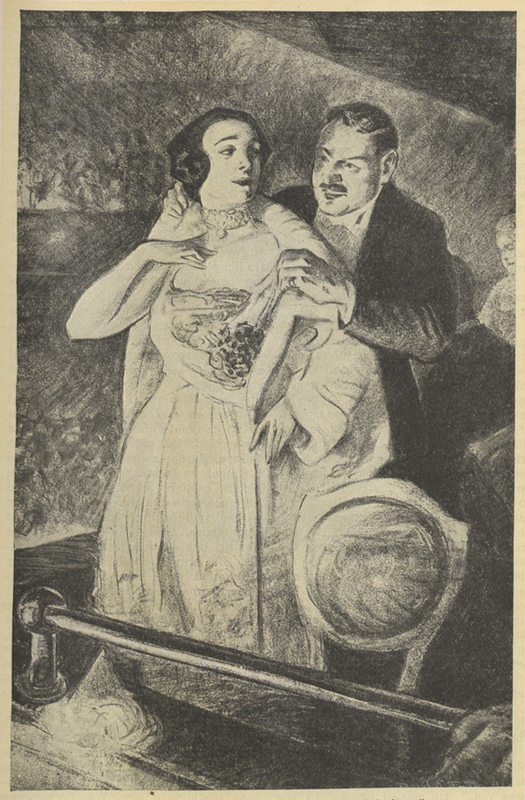 Connie was tormented by a suspicion that he was secretly backing the little Spanish woman who had sung many of her parts since she had been ill. He furthered the girl's interests because his wife had a very special consideration for her, and madame had that consideration because—But that was too long and too dreary a story to follow out in one's mind. Connie felt a tonsilitis disgust for opera-house politics, which, when she was in health, she rather enjoyed, being no mean strategist herself. The worst of being ill was that it made so many things and people look base. She was always afraid of being disillusioned. She wished to believe that everything for sale in Vanity Fair was worth the advertised price. When she ceased to believe in these delights, she told herself, her pulling power would decline and she would go to pieces. In some way the chill of her disillusionment would quiver through the long, black line which reached from the box-office down to Seventh Avenue on nights when she sang. They shivered there in the rain and cold, all those people, because they loved to believe in her inextinguishable zest. She was no prouder of what she drew in the boxes than she was of that long, oscillating tail, little fellows in thin coats, Italians, Frenchmen, South-Americans, Japanese. When she had been cloistered like a Trappist for six weeks, with nothing from the outside world but notes and flowers and disquieting morning papers, Connie told Miles Creedon that she could not endure complete isolation any longer. "I simply cannot live through the evenings. They have become horrors to me. Every night is the last night of a condemned man. I do nothing but cry, and that makes my throat worse." Miles Creedon, handsomest of his profession, was better looking with some invalids than with others. His athletic figure, his red cheeks, and splendid teeth always had a cheering effect upon this particular patient, who hated anything weak or broken. "What can I do, my dear? What do you wish? Shall I come and hold your lovely hand from eight to ten? You have only to suggest it." "Would you do that even? No, caro mio, I take far too much of your time as it is. For an age now you have been the only man in the world to me and you have been charming. But the world is big, and I am missing it. Let some one come to-night, some one interesting, but not too interesting. Pierce Tevis, for instance. He is just back from Paris. Tell the nurse I may see him for an hour to-night," Connie finished pleadingly, and put her fingers on the doctor's sleeve. He looked down at them and smiled whimsically. Like other people, he was weak to Connie Ayrshire. He would do for her things that he would do for no one else; would break any engagement, desert a dinner-table, leaving an empty place and an offended hostess, to sit all evening in Connie's dressing-room, spraying her throat and calming her nerves, using every expedient to get her through a performance. He had studied her voice like a singing master; knew all of its idiosyncracies and the emotional and nervous perturbations which affected it. When it was permissible, sometimes when it was not permissible, he indulged her caprices. On this sunny morning her wan, disconsolate face moved him. "Yes, you may see Tevis this evening if you will assure me that you will not shed one tear for twenty-four hours. I may depend on your word?" He rose, and stood before the deep couch on which his patient reclined. Her arch look seemed to say, "On what could you depend more?" Creedon smiled, and shook his head. "If I find you worse to-morrow—" He crossed to the writing-table and began to separate a bunch of tiny flame-colored rosebuds. "May I?" Selecting one, he sat down on the chair from which he had lately risen, and leaned forward while Connie pinched the thorns from the stem and arranged the flower in his buttonhole. "Thank you. I like to wear one of yours. Now I must be off to the hospital. I 've a nasty little operation to do this morning. I 'm glad it's not you. View Image of Page 435 Shall I telephone Tevis about this evening?" Connie hesitated. Her eyes ran rapidly about, seeking a likely pretext. Creedon laughed. "Oh, I see. You 've already asked him to come. You were so sure of me! Two hours in bed after lunch, with all the windows open, remember. Read something diverting, but not exciting; some homely British author; nothing abandonné. And don't make faces at me. Until to-morrow!" When her charming doctor had disappeared through the doorway, Connie fell back on her cushions and closed her eyes. Her mocking-bird, excited by the sunlight, was singing in his big gilt cage, and a white lilac-tree that had come that morning was giving out its faint sweetness in the warm room. But Connie looked paler and wearier than when the doctor was with her. Even with him she rose to her part just a little; could n't help it. And he took his share of her vivacity and sparkle, like every one else. He believed that his presence was soothing to her. But he admired; and whoever admired, blew on the flame, however lightly. The mocking-bird was in great form this morning. He had the best bird voice she had ever heard, and Connie wished there were some way to note down his improvisations; but his intervals were not expressible in any scale she knew. Parker White had brought him to her from Ojo Caliente, in New Mexico, where he had been trained in the pine forests by an old Mexican and an ill-tempered, lame master-bird, half thrush, that taught young birds to sing. This morning, in his song there were flashes of silvery Southern springtime; they opened inviting roads of memory. In half an hour he had sung his disconsolate mistress to sleep. That evening Connie sat curled up on the deep couch before the fire awaiting Pierce Tevis. Her costume was folds upon folds of diaphanous white over equally diaphanous rose, with a line of white fur about her neck. Her beautiful arms were bare. Her tiny Chinese slippers were embroidered so richly that they looked like the painted porcelain of old vases. She looked like a sultan's youngest, newest bride; a beautiful little toy-woman, sitting at one end of the long room which composed about her, which, in the soft light, seemed happily arranged for her. There were flowers everywhere: rose-trees; camellia-bushes, red and white; the first forced hyacinths of the season; a feathery mimosa-tree tall enough to stand under. The long front of Connie's study was all windows. At one end was the fireplace, before which she sat. At the other, set back in a lighted alcove, hung a big, warm, sympathetic interior by Lucien Simon, a group of Connie's friends having tea in the painter's salon in Paris. The room in the picture was flooded with early lamp-light, and one could feel the gray, chill winter twilight in the Paris streets outside. There stood the lion-like old composer, who had done much for Connie, in his most characteristic attitude before the hearth. Mme. Simon sat at the tea-table. B——, the historian, and H——, the philologist, stood in animated discussion behind the piano, while Mme. H—— was tying on the bonnet of her lovely little daughter. Marcel Durand, the physicist, sat alone in a corner, his startling black-and-white profile lowered broodingly, his cold hands locked over his sharp knee. A genial, red-bearded sculptor stood over him, about to touch him on the shoulder and waken him from his dream. This painting made simply another room, so that Connie's study on Central Park West seemed to open into that charming French interior, into one of the most highly harmonized and richly associated rooms in Paris. There her friends sat or stood about, men distinguished, women at once plain and beautiful, with their furs and bonnets, their clothes that were so distinctly not smart—all held together by the warm lamp-light, by an indescribable atmosphere of graceful and gracious human living. Pierce Tevis, after he had entered noiselessly and greeted Connie, stood before her fire and looked over her shoulder at this picture. "It 's nice that you have them there together, now that they are scattered, God knows where, fighting to preserve View Image of Page 436 just that. But your own room, too, is charming," he added at last, taking his eyes from the canvas. "Bah! I can help to feed the lamp, but I can't supply the dear things it shines upon." "Well, to-night it shines upon you and me, and we are n't so bad." Tevis stepped forward and took her hand affectionately. "You 've been over a rough bit of road. I' m so sorry. It 's left you looking very lovely, though. Has it been very hard to get on?" She brushed his hand gratefully against her cheek and nodded. "Awfully dismal. Everything has been shut out from me but—gossip. That always gets in. Often I don't mind, but this time I have. People do tell such lies about me." "Of course we do. That 's part of our fun, one of the many pleasures you give us. It only shows how hard up we are for interesting public personages, for a royal family, for romantic fiction, if you will. But I never hear any stories that wound me, and I 'm very sensitive about you." "I 'm gossiped about rather more than the others, am I not?" "I believe! Heaven send that the day when you are not gossiped about is far distant! Do you want to bite off your nose to spite your pretty face? You are the sort of person who makes myths. You can't turn around without making one. That 's your singular good luck. A whole staff of publicity men, working day and night, could n't do for you what you do for yourself. There is an affinity between you and the popular imagination." "I suppose so," said Connie, and sighed. "All the same, I 'm getting almost as tired of the person I 'm supposed to be as of the person I really am. I wish you would invent a new Connie Ayrshire for me, Pierce. Can't I do something revolutionary? Marry, for instance?" "Whatever you do, don't try to change your legend. You have now the one that gives the greatest satisfaction to the greatest number of people. Don't disappoint your public. The popular imagination, to which you make such a direct appeal, for some reason wished you to have a son, so it has given you one. I 've heard a dozen versions of the story, but it is always a son, never by any chance a daughter. Your public gives you what is best for you. Let well enough alone." Connie yawned and dropped back on her cushions. "He still persists, does he, in spite of never being visible?" "Oh, but he has been seen by ever so many people. Let me think a moment." He sank into an attitude of meditative ease. "The best description I ever had of him was from a friend of my mother, an elderly woman, thoroughly reliable and matter-of-fact. She has seen him often. He is kept in Russia, in Moscow, at school. He is about eight years old and of marvelous beauty. He is always that in every version. My old friend has seen him being driven in his sledge on the Nevskii Prospekt on winter afternoons; black horses with silver bells and a giant in uniform on the seat beside the driver. He is always attended by this giant, who is responsible to the Grand Duke Paul for the boy. This lady can produce no evidence beyond his beauty and his splendid furs and the fact that all the Americans in Moscow know that he is your son." "If the Grand Duke Paul had a son, any old rag of a son, the provinces of Moscow and Tula could n't hold him. He may, for aught I know, actually pretend to have a son. It would be very like him." She looked at her finger-tips and her rings disapprovingly for a moment. "Do you know, I 've been thinking that I would rather like to lay hands on that youngster. I believe he 'd be interesting. I 'm bored with the world." "Would you like him, really?" "Of course I should," she said indignantly. "But, then, I like other things, too, and one has to choose. When one has only two or three things to choose from, life is hard; when one has many, it is harder still. No, on the whole, I don't mind that story. It 's rather pretty except for the grand duke. But not all of them are pretty." "Well, none of them are very ugly; at least I never heard but one that troubled me, and that was long ago." "That is what I want to know; how do the ugly ones get started? How did that one get going and what was it about? Is it too dreadful to repeat?" "No, it 's not especially dreadful; merely rather shabby. If you really wish to know, and won't be vexed, I can tell you exactly how it got going, for I took the trouble to find out. But it 's a long story, and you really had nothing whatever to do with it." "Then who did have to do with it? Tell me; I should like to know exactly how even one of them originated." "Will you be comfortable and quiet and not get into a rage, and let me look at you as much as I please?" Connie nodded, and Tevis sat watching her indolently while he debated how much of his story he ought not to tell her. Connie liked being looked at by intelligent persons. She knew exactly how good looking she was, and she knew, too, that, pretty as she was, some of those rather sallow women in the Simon painting had a kind of beauty which she would never have. This knowledge, Tevis was thinking, this important realization, contributed more to her loveliness than any other thing about her; more than her smooth, ivory skin or her changing gray eyes, the delicate forehead above them, or even the heady smile, which was gradually becoming too bright and too intentional, out in the world, at least. Here by her own fire she still had for her friends a smile less electric than the one she flashed from stages. She could still be, in short, intime, a quality which few artists keep, which few ever had. Connie broke in on her friend's meditations. "You may smoke. I had rather you did. I hate to deprive people of things they like." "No, thanks. May I have those chocolates on the tea-table? They are quite as bad for me. May you? No, I suppose not." He settled himself by the fire, with the candy beside him, and began in the agreeable voice which always soothed his listener. "As I said, it was a long while ago, when you first came back to this country and were singing at the Manhattan. I dropped in at the Metropolitan one evening to hear something new they were trying out. It was an off night, no pullers in the cast, and nobody in the boxes but governesses and poor relations. At the end of the first act two people entered one of the boxes in the second tier. The man was Siegmund Stein, the department-store millionaire, and the girl, so the men about me in the omnibus box began to whisper, was Connie Ayrshire. I did n't know you then, but I was unwilling to believe that you were with Stein. I could not contradict them at that time, however, for the resemblance, if it was merely a resemblance, was absolute, and all the world knew that you were not singing at the Manhattan that night. The girl's hair was dressed just as you then wore yours. Moreover, her head was small and restless like yours, and she had your coloring, your eyes, your chin. She carried herself with the critical indifference one might expect in an artist who had come for a look at a new production that was clearly doomed to failure. She applauded lightly. She made comments to Stein when comments were natural enough. I thought, as I studied her face with the glass, that her nose was a trifle thinner and cleaner-cut than yours, a prettier nose, my dear Connie, but stupider and more inflexible. But I was troubled until I saw her laugh, and then I knew she was a counterfeit. I had never seen you laugh, but I knew that you would not laugh like that. It was not boisterous; indeed, it was consciously refined, mirthless, meaningless. In short, it was not the laugh of one whom our friends in there"—pointing to the Simon painting—"would honor with their affection and admiration." "So you would really have been hood-winked except for that! You may be sure that no woman, no intelligent woman, would have been. Why do we ever take the trouble to look like anything for any of you? I could count on my four fingers"—she held them up and View Image of Page 439 " 'The throng began closing in upon me' " View Image of Page 440 shook them at him—"the men I 've known who had the least perception of what any woman really looked like, and they were all dressmakers. Even painters"—glancing back in the direction of the Simon picture—"never get more than one type through their thick heads; they try to make all women look like some wife or mistress. You are all the same; you never see our real faces. What you do see is some cheap conception of prettiness you got from a colored supplement when you were adolescents. It 's too discouraging. I 'd rather take vows and veil my face forever from such abominable eyes. In the kingdom of the blind any petticoat is a queen." Connie thumped the cushion with her elbow. "Well, I can't do anything about it. Go on with your story." "Are n't you furious, Connie! And I thought I was so shrewd. I 've quite forgotten where I was. Anyhow, I was not the only man fooled. After the last curtain I met Villard, the press man of that management, in the lobby, and asked him whether Connie Ayrshire was in the house. He said he thought so. Stein had telephoned for a box, and said he was bringing one of the artists from the other company. Villard had been too busy about the new production to go to the box, but he was quite sure the woman was Ayrshire, whom he had met in Paris. "Not long after that I met Dan Cutter, a classmate of mine, at the Harvard Club. He 's a journalist, and he used to keep such eccentric hours that I had not run across him for a long time. We got to talking about modern French music, and discovered that we both had a very lively interest in Connie Ayrshire.
" 'Could you tell me,' Dan asked abruptly, 'why, with pretty much all the known world to choose her friends from, this young woman should flit about with Siegmund Stein? It prejudices people against her. He 's a most objectionable person.' "
" 'Have you,' I asked, 'seen her with him, yourself?' "
"Yes, he had seen her driving with Stein, and some of the men on his paper had seen her dining with him at rather queer places down town. Stein was always hanging about the Manhattan on nights when Connie sang. I told Dan that I suspected a masquerade. That interested him, and he said he thought he would look into the matter. In short, we both agreed to look into it. Finally, we got the story, though Dan could never use it, could never even hint at it, because Stein carries heavy advertising in his paper. "To make you see the point, I must give you a little history of Siegmund Stein. Any one who has seen him never forgets him. He is one of the most hideous men in New York, but it 's not at all the common sort of ugliness that comes from overeating and automobiles. He is n't one of the fat horrors. He has one of those rigid, horselike faces that never tell anything; a long nose, flattened as if it had been tied down; a scornful chin; long, white teeth; flat cheeks, yellow as a Mongolian's; tiny, black eyes, with puffy lids and no lashes; dingy, dead-looking hair—looks as if it were glued on. "Stein came here a beggar from somewhere in Australia. He began by working on the machines in old Rosenthal's garment factory. He became a speeder, a foreman, a salesman; worked his way ahead steadily until the hour when he rented an old dwelling-house on Seventh Avenue and began to make misses' and juniors' coats. I believe he was the first manufacturer to specialize in those particular articles. Dozens of garment manufacturers have come along the same road, but Stein is like none of the rest of them. He is, and always was, a personality. While he was still at the machine, a hideous, underfed little whippersnapper, he was already a youth of many-colored ambitions, deeply concerned about his dress, his associates, his recreations. He haunted the old Astor Library and the Metropolitan Museum, learned something about pictures and porcelains, took singing lessons, though he had a voice like a crow's. When he sat down to his baked apple and doughnut in a basement lunch-room, he would prop a book up before him and address his food with as much leisure and ceremony as if he were dining at his club. He held himself at a distance from his fellow-workmen and somehow always managed to impress them with his su- View Image of Page 441 periority. He had inordinate vanity, and the care of his homely person took a great deal of his time. There are many stories about his foppishness. After his first promotion in Rosenthal's factory, he bought a new overcoat. A few days later, one of the men at the machines, which Stein had just quitted, appeared in a coat exactly like it. Stein could not discharge him, but he gave his own coat to a newly arrived Russian boy who had none. He was already magnificent. "After he began to make headway with misses' and juniors' cloaks, he became a collector—etchings, china, old musical instruments. He had a dancing master, and engaged a beautiful Brazilian widow—she was said to be a secret agent for some South American republic—to teach him Spanish. He cultivated the society of the unknown great, poets, actors, musicians. He entertained them sumptuously, and they regarded him as a deep, mysterious Jew who had the secret of gold, which they had not. His business associates thought him a man of taste and culture, a patron of the arts, a credit to the garment trade. "One of Stein's many ambitions was to be thought a success with women. He got considerable notoriety in the garment world by his attentions to an emotional actress who is now quite forgotten, but who had her little hour of expectation. Then there was a dancer; then, just after Gorky's visit here, a Russian anarchist woman. After that the coat-makers and shirtwaist-makers began to whisper that Stein's great success was with Connie Ayrshire. "It is the hardest thing in the world to disprove such a story, as Dan Cutter and I discovered. We managed to worry down the girl's address through a taxi-cab driver who got next to Stein's chauffeur. She had an apartment in a decent-enough house on Waverly Place. Nobody ever came to see her but Stein, her sisters, and a little Italian girl from whom we got the story. "The counterfeit's name was Ruby Mohr. She worked in a shirtwaist factory, and this Italian girl, Margarita, was her chum. Stein came to the factory when he was hunting for living models for his new department store. He looked the girls over, and picked Ruby out from several hundred. He had her call at his office after business hours, tried her out in cloaks and evening gowns, and offered her a position. She never, however, appeared as a model in the Sixth Avenue store. Her likeness to the newly arrived prima donna suggested to Stein a new act in the play he was always putting on. He gave two of her sisters positions as saleswomen, but Ruby he established in an apartment on Waverly Place. "To the outside world Stein became more mysterious in his behaviour than ever. He dropped his Bohemian friends. No more suppers and theater-parties. Whenever Connie sang, he was in his box at the Manhattan, usually alone, but not always. Sometimes he took two or three good customers, large buyers from St. Louis or Kansas City. His coat factory is still the biggest earner of his properties. I 've seen him there with these buyers, and they carried themselves as if they were being let in on something; took possession of the box with a proprietory air, smiled and applauded and looked wise as if each and every one of them were friends of Connie Ayrshire. While they buzzed and trained their field-glasses on the prima donna, Stein was impassive and silent. I don't imagine he even told many lies. He is the most insinuating cuss, anyhow. He probably dropped his voice or lifted his eyebrows when he invited them, and let their own eager imaginations do the rest. But what tales they took back to their provincial capitals! "Sometimes, before they left New York, they were lucky enough to see Connie dining with their clever garment man at some restaurant, her back to the curious crowd, her face half concealed by a veil or a fur collar. Those people are like children; nothing that is true or probable interests them. They want the old, gaudy lies, told always in the same way. Siegmund Stein and Connie Ayrshire—a story like that, once launched, is repeated unchallenged for years among New York factory sports. In St. Paul, St. Jo, Sioux City, Council Bluffs, there used to be clothing View Image of Page 442 "There was that fool Peppo, beleaguered by a bevy of fair women" View Image of Page 443 stores where a photograph of Connie Ayrshire hung in the fitting-room or over the proprietor's desk. "This girl impersonated you successfully to the lower manufacturing world of New York for two seasons. I doubt if it could have been put across anywhere else in the world except in this city, which pays you so magnificently and believes of you what it likes. Then you went over to the Metropolitan, stopped living in hotels, took this apartment, and began to know people. Stein discontinued his pantomime at the right moment, withdrew his patronage. Ruby, of course, did not go back to shirtwaists. A business friend of Stein's, a man who was not romantic, took her over, and she dropped out of sight. Last winter, one cold, snowy night, I saw her once again. She was going into a saloon hotel with a tough-looking young fellow. She had been drinking, she was shabby, and her blue shoes left stains in the slush. But she still looked amazingly, convincingly like a battered, hardened Connie Ayrshire. As I saw her going up the brass-edged stairs, I said to myself—"
"Never mind that." Connie rose quickly, took an impatient step to the hearth, and thrust her shining porcelain slipper out to the fire. "The girl does n't interest me. There is nothing I can do about her, and of course she never looked like me at all. But what did Stein do without me?" "Stein? Oh, he chose a new rôle. He married with great magnificence—married a Miss Mandelbaum, a California heiress. Her people have a line of department stores along the Pacific Coast. The Steins now inhabit a great house on Fifth Avenue that used to belong to people of a very different sort. To old New-Yorkers, it 's a historic house." Connie laughed, and sat down on the end of her couch nearest her guest; sat upright, without cushions. "I imagine I know more about that house than you do. Let me tell you how I made the sequel to your story. "It has to do with Peppo Amoretti. You may remember that I brought Peppo to this country, and brought him in, too, the year the war broke out, when it was n't easy to get boys who had n't done military service out of Italy. I had taken him to Munich to have some singing lessons. After the war came on we had to get from Munich to Naples in order to sail at all. We were told that we could take only hand luggage on the railways, but I took nine trunks and Peppo. I dressed Peppo in knickerbockers, made him brush his curls down over his ears like doughnuts, and carry a little violin-case. It took us eleven days to reach Naples. I got my trunks through purely by personal persuasion. Once, at Naples, I had a frightful time getting Peppo on the boat. I declared him as hand-luggage; he was so travel-worn and so crushed by his absurd appearance that he did not look like much else. One inspector had a sense of humor, and passed him at that, but the other was inflexible. I had to be very dramatic. Peppo was frightened, and there is no fight in him, anyhow.
" 'Per me tutto e indifferente, Signorina,' he kept whimpering. 'Why should I go without it? I have lost it.' "
" 'Which?' I screamed. 'Not the hat-trunk?' "
" 'No, no; mia voce. It is gone since Ravenna.' "
"He thought he had lost his voice somewhere along the way. At last I told the inspector that I could n't live without Peppo, and that I would throw myself into the bay. I took him into my confidence. Of course, when I found I had to play on that string, I wished I had n't made the boy such a spectacle. But ridiculous as he was, I managed to make the inspector believe that I had kidnapped him, and that he was indispensable to my happiness. I found that incorruptible official, like most people, willing to aid one so utterly depraved. I could never have got that boy out for any proper, reasonable purpose, such as giving him a job or sending him to school. Well, it 's a queer world! But I must cut all that and get to the Steins. "That first winter Peppo had no chance at the opera. There was an iron ring about him, and my interest in him only made it all the more difficult. We 've become a nest of intrigues down there; worse than the Scala. Peppo had View Image of Page 444 to scratch along just any way. One evening he came to me and said he could get an engagement to sing for the grand rich Steins, but the condition was that I should sing with him; the barcarole from 'Hoffman' and a duet from 'Pagliacci.' They would pay, oh, anything. And the fact that I had sung a private engagement with him would give him other engagements of the same sort. As you know, I never sing private engagements; but to help the boy along, I consented. "On the night of the party, Peppo and I went to the house together in a taxi. My car was ailing. At the hour when the music was about to begin, the host and hostess appeared at my dressing-room, up-stairs. Is n't he wonderful? Your description was most inadequate. I never encountered such restrained, frozen, sculptured vanity. It 's not childish like an artist's vanity; it 's a sort of grim, inflexible purpose. My hostess struck me as extremely good natured and jolly, though somewhat intimate in her manner. Her reassuring pats and smiles puzzled me at the time, I remember, when I did n't know that she had anything in particular to be large-minded and charitable about. Her husband made known his willingness to conduct me to the music-room, and we ceremoniously descended a staircase blooming like the hanging-gardens of Babylon. From there I had my first glimpse of the company. They were strange people. The women glittered like Christmas-trees. When we were half-way down the stairs, the buzz of conversation stopped so suddenly that some foolish remark I happened to be making rang out like oratory. Every face was lifted toward us. My host and I completed our descent and went the length of the drawing-room through a silence which somewhat awed me. I could n't help wishing that one could ever get that kind of attention in a concert-hall. In the music-room Stein insisted upon arranging things for me. I must say that he was neither awkward nor stupid, not so wooden as most rich men who rent singers. I was probably affable. One has, under such circumstances, to be either gracious or pouty. Either you have to stand and sulk, like an old-fashioned German singer who wants the piano moved about for her like a tea-wagon, and the lights turned up and the lights turned down, or you have to be a trifle forced, like a débutante trying to make good. The fixed attention of my audience affected me. I was aware of unusual interest, of a thoroughly enlisted public. When, however, my host at last left me, I felt the tension relax to such an extent that I wondered whether by any chance he, and not I, was the object of so much curiosity. 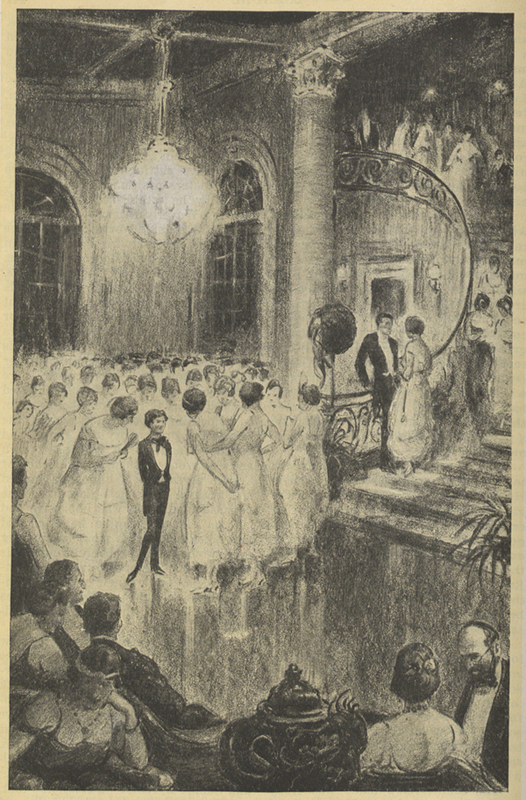 But, at any rate, their cordiality pleased me so well that after Peppo and I had finished our numbers I sang an encore or two, and I stayed through Peppo's performance because I felt that they liked to look at me. "I had asked not to be presented to people, but Mrs. Stein, of course, brought up a few friends. The throng began closing in upon me, glowing faces bore down from every direction, and I realized that, among people of such unscrupulous cordiality I must look out for myself. I ran through the drawing-room and fled up the stairway, which was thronged with Old Testament characters. As I passed them, they all looked at me with delighted, cherishing eyes, as if I had at last come back to my native hamlet. At the top of the stairway a young man who looked like a camel, with its hair parted on the side, stopped me, seized my hands and said he must present himself, as he was such an old friend of Siegmund's bachelor days. I said, 'Yes, how interesting!' The atmosphere was somehow so thick and personal that I felt uncomfortable. "When I reached my dressing-room Mrs. Stein followed me to say that I would, of course, come down to supper, as a special table had been prepared for me. I replied that it was not my custom. "'But here it is different. With us you must feel perfect freedom. Siegmund will never forgive me if you do not stay. After supper our car will take you home.' She was overpowering. She had the manner of an intimate and indulgent friend of long standing. She seemed to have come to make me a visit. I could only get rid of her by telling View Image of Page 445 her that I must see Peppo at once, if she would be good enough to send him to me. She did not come back, and I began to fear that I would actually be dragged down to supper. It was as if I had been kidnapped. I felt like Gulliver among the giants. These people were all too—well, too much what they were. No chill of manner could hold them off. I was defenseless. I must get away. I ran to the top of the staircase and looked down. There was that fool Peppo, beleaguered by a bevy of fair women. They were simply looting him, and he was grinning like an idiot. I gathered up my train, ran down, and made a dash at him, yanked him out of that circle of rich contours, and dragged him by a limp cuff up the stairs after me. I told him that I must escape from that house at once. If he could get to the telephone, well and good; but if he could n't get past so many deep-breathing ladies, then he must break out of the front door and hunt me a cab on foot. I felt as if I were about to be immured within a harem. "He had scarcely dashed off when the host called my name several times outside the door. Then he knocked and walked in, uninvited. I told him that I would be inflexible about supper. He must make my excuses to his charming friends; any pretext he chose. He did not insist. He took up his stand by the fireplace and began to talk; said rather intelligent things. I did not drive him out; it was his own house, and he made himself agreeable. After a time a deputation of his friends came down the hall, somewhat boisterously, to say that supper could not be served until we came down. Stein was still standing by the mantel, I remember. He scattered them, without moving or speaking to them, by a portentous look. There is something hideously forceful about him. He took a very profound leave of me, and said he would order his car at once. In a moment Peppo arrived, splashed to the ankles, and we made our escape together. "A week later Peppo came to me in a rage, with a paper called 'The American Gentleman,' and showed me a page devoted to three photographs: Mr. and Mrs. Siegmund Stein, lately married in New York City, and Connie Ayrshire, operatic soprano, who sang at their house-warming. Mrs. Stein and I were grinning our best, looked frantic with delight, and Siegmund frowned inscrutably between us. Poor Peppo was n't mentioned. Stein has a publicity sense." "And you have enormous publicity value and no discretion. It was just like you to fall for such a plot, Connie. You 'd be sure to." "What 's the use of discretion?" She murmured behind her hand. "If the Steins want to adopt you into their family circle, they 'll get you in the end. That 's why I don't feel troubled about your Ruby. She and I are in the same boat. We are both the victims of circumstance, and in New York so many of the circumstances are Steins."